Welcome to those of you joining me from Rolling with the Magic and those of you just hopping aboard. I am the 2nd stop on our Magical Blogorail. When it comes to Christmas at Disney, I think my favorite part will be when I get to experience Epcot’s World Showcase. I know that Mickey’s Very Merry Christmas Party is over the top, and so is the Osborne Family Spectacle of Dancing Lights, but to me, I think the true meaning of Christmas is seen most clearly at Epcot. Did you know that each of the pavilions shares their own traditions with us on how they celebrate the Holiday season in their native land? 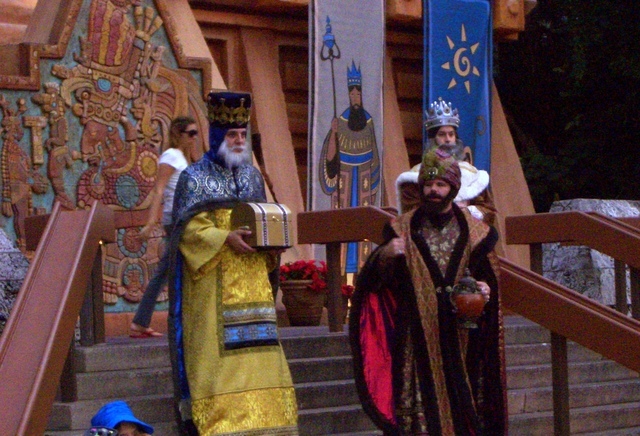 In the Mexico Pavilion, the Three Kings greet you and tell you how they celebrate the Holidays. The Mexico term for Christmas is La Navidad, and the main celebration is known as Las Posadas (Posadas is Spanish for “inn”). The story revolves around the journey of Joseph and Mary to Bethlehem, and their attempts to find a room at the inn. Included in the celebration in Mexico is Three Kings Day, which takes place on January 6th, the day traditionally known as the day that the Three Kings arrived to see the Baby Jesus. In our country, we sometimes call that day “Old Christmas”. I’m a real fan of all of the lights that you can find at the Magic Kingdom and at Disney’s Hollywood Studios, but as I’ve gotten older — notice I didn’t say wiser — I really appreciate the traditions of Christmas, and I think that the World Showcase does the best job of reflecting what the true meaning of Christmas is. What is your favorite part of the Holiday season, whether you celebrate Christmas, Hanukkah, Kwanzaa, or another holiday? Please let me know in the comments, and thanks!